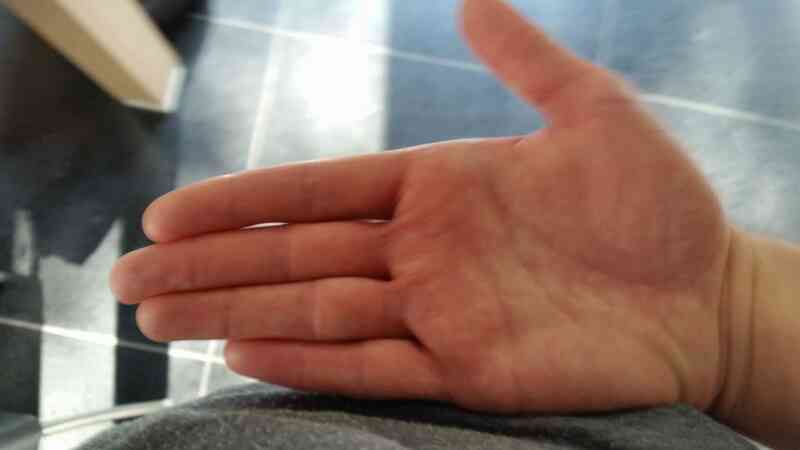 I have been measuring my 2d and 4d of my right hand multiple times, but I never get the same outcome. What do you think, is my 2D-4D? I'm male. Is it high? Thank you for your effort, but this type of photo is not equal to a 'photocopy'. Why not measure your digit lengths yourself? PS. At first sight your 2d:4d digit ratio appears within the upper side of the normal range of a white male, but I am not sure... because the angle of the camera could generate an effect that is not really there. What does upper side of the normal range mean according to you? Thanks for sharing your measurements Braemar. An average 2d:4d digit ratio of 0.96 is just perfectly normal (I have to withdraw the aspect of the 'upper side' which I mentioned earlier), I don't think that one can attribute much meaning to this - though in a way one could describe this to be a positive sign (without any specified meaning). Further: I read that self-measured 2D-4D is often higher than with more precise/digital methodies. So I think there is some confusion about what is average, depending on the methode a research is using. Well... yes, internet studies involving large populations have suggested that 'self-reported digit ratios' tend to produced higher values in large groups; however, one can wonder regarding the cause of this effect - I don't think that one should translate those results into the conclusion that (non-expert) self-reports are always higher than measurements made by (expert) researchers. 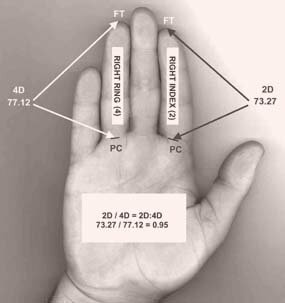 ...I suspect this effect might be partly explained as follows: non-experts might be inclined to make less precise measurement, which could more easily lead to concluding that the length of the both fingers is close to equal - which might lead to 1.0 measurements in hands where the ratio is actually 0.99 or 0.98 ... or 1.01 or 1.02 - but the amount of people falling in the 1.01 & 1.02 category is much smaller than the 0.98 & 0.99 category (see picture below).